Heat oven to 350°F. Bake French bread on ungreased cookie sheet as directed on can. Meanwhile, in blender or food processor, place beans with liquid from can; cover and blend until smooth (add chicken broth to thin if necessary). In 12-inch skillet, heat oil over medium-high heat. Cook onion in oil 1 to 2 minutes or until tender, stirring constantly. Stir in the blended beans; cook uncovered 1 to 2 minutes or until thickened, stirring constantly. Carefully cut baked French bread in half lengthwise; place on cookie sheet, cut sides up. 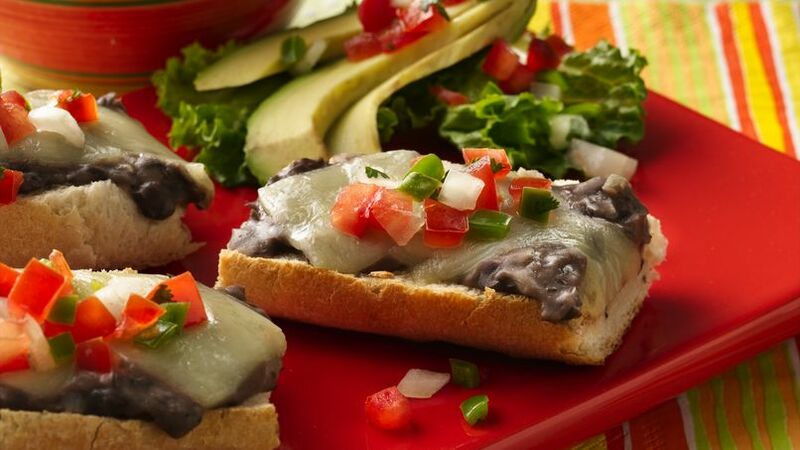 Spread refried beans on cut sides of loaf; top with cheese. Bake about 10 minutes or until cheese is melted. Top with salsa; cut each half into 4 molletes. Serve immediately. Sweet Molletes: Bake French bread as directed on can; cool 5 minutes. Cut in half lengthwise. Spread 1 tablespoon butter or margarine on cut side of each half. Bake 15 minutes longer. Immediately sprinkle 1 tablespoon sugar over butter on each. Serve any leftover refried beans with tomato-based rice or eggs.